The main focus of Exeter however, rests with the beauty and the majesty of Sequoia and Kings Canyon National Parks. Become inspired by the beauty that surrounds this wilderness and participate in the recreational activities it has to offer. 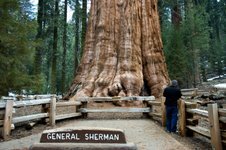 One of the highlights is the General Sherman Tree, it is located in this park and it is known as the world’s largest living tree. Only 10 miles from center of town, you have access to popular Lake Kaweah, located in the foothills of the Sierra Nevada mountain range; it provides an exciting background for fishing, swimming and water-skiing. The lake and surrounding areas contain a variety of plant and wildlife habitats, including open grasslands, oak woodlands, and riparian areas. National recognition was given to Exeter in 2000 as “One of America’s Prettiest Painted Places”. More than twenty huge professional murals have been painted .A "Festival of Arts" promotes economic development through the arts and tourism by producing an outdoor art gallery reflecting its history and culture. Read the detail of each one here. In addition, Exeter is known for growing the best naval oranges in the world and has been given the title of “Citrus Capital of the World” as well. 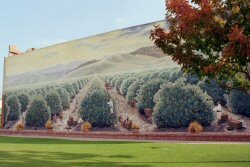 With their fall harvest celebrations, parades, arts and entertainment, and cuisine, you may be interested to know that artists have continued to express this town’s history and culture through impressive murals which can be viewed throughout the downtown area. With their excellent educational system intact, Exeter is dedicated to providing students with the highest quality of education to their students. In addition, providing a quality of life to its population is also a priority. With a population of approximately 10,000 residents, Exeter offers the best in shopping, cuisine, as well as annual events and festivals. If you prefer to retire to a small town which also offers you the opportunity to visit two the world’s well-known cities, retire to Exeter California and become enchanted with the town, its tradition, and its people.